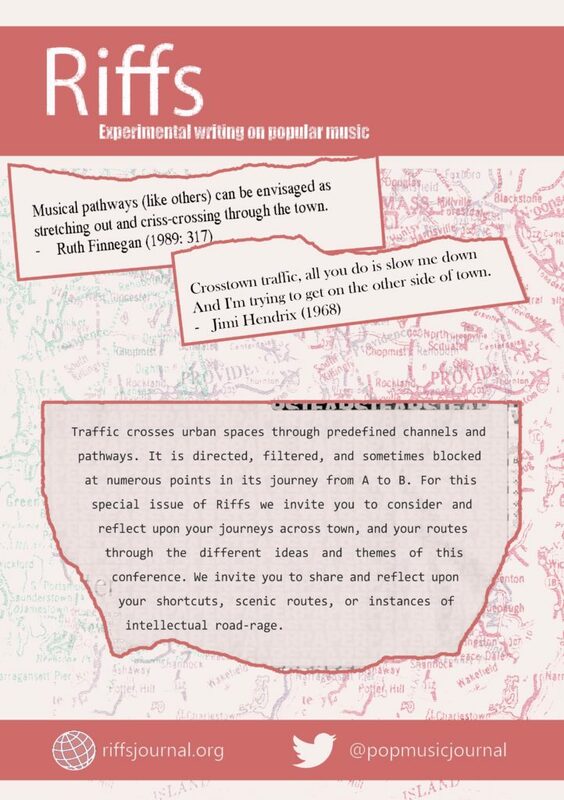 The Riffs team are pleased to announce a special collaborative issue that will be created, live, during the 2018 IASPM UK & Ireland Conference, “Crosstown Traffic: Popular Music Theory and Practice”, which is taking place at the University of Huddersfield between 3rd-5th September. If you are attending IASPM UK & Ireland 2018, please do consider responding to the prompt below with a contribution. We will be editing, collating and printing this special issue on site during the conference, and will distribute free copies on Wednesday 5th September. Full details are below. Join us for this very special issue! Traffic crosses urban spaces through predefined channels and pathways. It is directed, filtered, and sometimes blocked at numerous points in its journey from A to B. For this special issue of Riffs we invite you to consider and reflect upon your journeys across town, and your routes through the different ideas and themes of this conference. We invite you to share and reflect upon your shortcuts, scenic routes, or instances of intellectual road-rage. 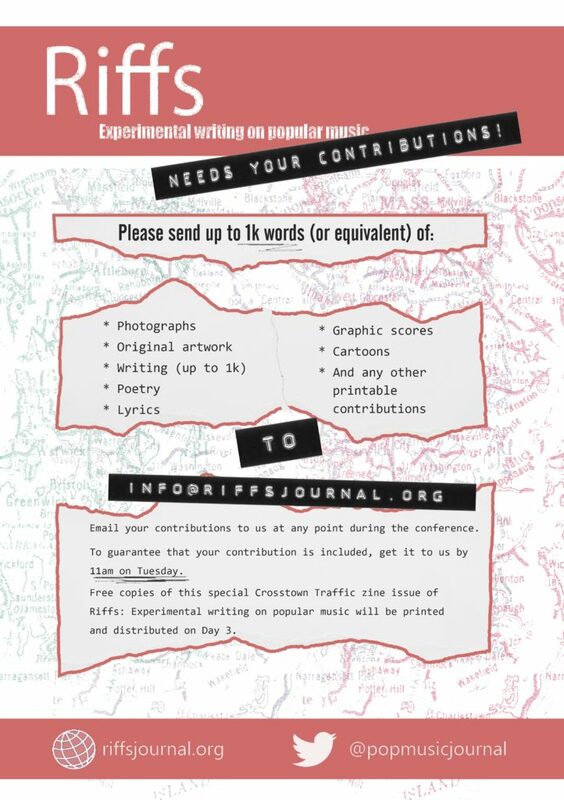 Along with emailing your contributions to us at any point during the conference, you can also bring them in person to our ‘pop-up’ editorial office. To guarantee that your contribution is included, get it to us by 11am on Tuesday 4th September. 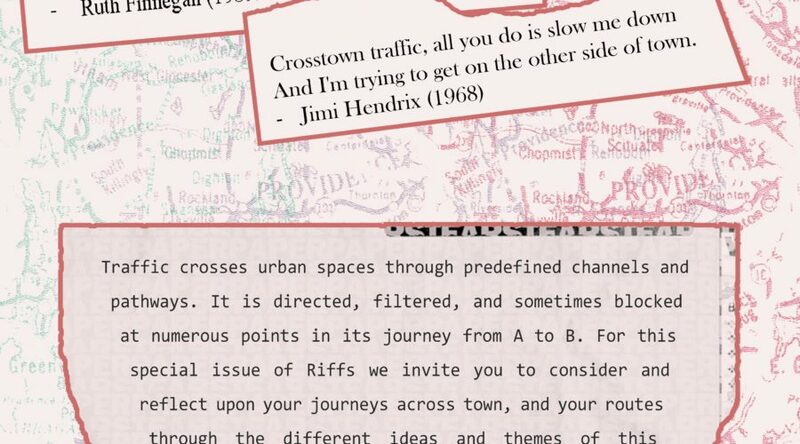 250 free copies of this special Crosstown Traffic zine issue of Riffs: Experimental writing on popular music will be printed and distributed on Day 3.